Rice seeds are seen in April 2008 in Biggs, California. Scientists at a Chinese university said Monday they can use rice to make albumin, a protein found in human blood that is often used for treating burns, traumatic shock and liver disease. Scientists at a Chinese university said Monday they can use rice to make albumin, a protein found in human blood that is often used for treating burns, traumatic shock and liver disease. When extracted from rice seeds, the protein is "physically and chemically equivalent to blood-derived human serum albumin (HSA)," said the research in the US-published Proceedings of the National Academy of Sciences. The findings could lead to a breakthrough in production of HSA, which typically comes from human blood donations. The demand for the blood protein is about 500 tons per year worldwide, and China has faced worrying shortages in the past. The rice method was devised by scientists at Wuhan University in China and colleagues from the National Research Council of Canada and the Center for Functional Genomics at the University at Albany in New York. First, they genetically engineered rice seeds to produce high levels of HSA. 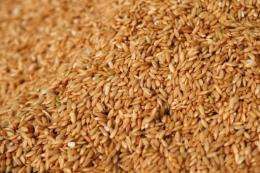 Then, they worked out a way to purify the protein from the seeds, gathering about 2.75 grams of the protein per kilogram (2.2 pounds) of rice. When they tested the rice-made protein in rats with liver cirrhosis, a common condition for which the human equivalent is often used, they found it produced similar outcomes to treatment with HSA. "Our results suggest that a rice seed bioreactor produces cost-effective recombinant HSA that is safe and can help to satisfy an increasing worldwide demand for human serum albumin," said the study. The protein is often used in the manufacture of vaccines and drugs and is given to patients with serious burn injuries, hemorrhagic shock and liver disease, the researchers said. In 2007, a shortage in China led to price spikes and a brief rise in the number of fraudulent albumin medicines on the market. Concerns have also been raised about the potential for the transmission of hepatitis and HIV, since the protein comes from human blood. Large-scale planting of genetically modified rice fields that could produce enough seed for mass production of the protein also raises environmental and food supply contamination concerns, since rice is a major world food staple. However, the study authors noted that rice is a largely self-pollinating crop, pointing to previous studies that showed "a very low frequency (0.04-0.80%) of pollen-mediated gene flow between genetically modified (GM) rice and adjacent non-GM plants." More research is needed to evaluate the safety of the rice-derived protein in animals and humans before it can be considered for the market. More information: "Large-scale production of functional human serum albumin from transgenic rice seeds," by Yang He, et al. PNAS.